“The first time I was offered a cigarette was by a 12-year- old Palestinian refugee named Odayee, in a refugee camp right out of Nablus called New Askar.” says 21-year- old RJ Khalaf, founder of LEAD Palestine. Born and raised in Vegas, Nevada, Khalaf comes from a long-line of Palestinians. His grandparents moved to the United States in 1964. When Khalaf was ten, he visited Palestine for the first time. 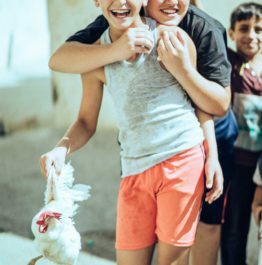 Three years later, he went back to volunteer at his uncle’s summer camp in Palestine and it was here that he began to imagine his own summer camp program. LEAD Palestine is an initiative that aims to empower, motivate, and inspire the next generation of Palestinian youth. Founded by two NYU undergraduate students, RJ Khalaf and Hannah Benson, LEAD Palestine is a leadership camp for seventh and eighth graders, living in New Askar, the refugee camp where Khalaf was offered his first cigarette almost a decade ago. For Khalaf and Benson, LEAD Palestine is a way of putting their leaderships skills in service to their passion for Palestinian refugees. The UN has done several reports about issues that young Palestinian youth face in the West Bank. The reports describe a general state of hopelessness and a general lack of empowerment amongst youth in these camps. It is this problem that LEAD Palestine is trying to address. LEAD Palestine has a three pillar approach. The first pillar consists of a summer day camp that will launch on August 14th of this year. The week long camp entails leadership based activities and workshops led by born and raised Palestinian university students. “They know what it’s like to grow up in that area and can speak to these kids at a level that you and I cannot” says Khalaf. Through these kinds of workshops, the camp aims to increase self-awareness, mindfulness, build a definition of leadership, spark collaboration, creativity and a general sense of teamwork. The second pillar of this organisation is a mentorship program. The Palestinian camp counsellors will continue to mentor the students long after the camp has ended and will be given a stipend, to reward them for their work with the youth and to incentivize them to continue to build and foster these relationships. The third pillar of LEAD Palestine is the creation of a student council organization within the refugee camp to encourage children to be leaders for themselves, and for their community. This is especially true for young women in the camp, who hardly fit the traditional image of an old, male leader. LEAD Palestine recently reached its fundraising goal with the support of the NYU Liberal Studies’ program, the NYU Office of Civic Engagement, as well as through the organization’s Go Fund Me page. Though funding is now in place, LEAD Palestine still faces challenges. Bureaucratic obstacles prevented the organization from working in the Gaza Strip, the place they had hoped to set up camp. Because of bureaucratic challenges that exist in the Gaza Strip, LEAD Palestine had to relocate its programs to New Askar. When asked if he had any anxieties about the program, Khalaf paused. Though the founders are tentative to define long-form expansion goals for the organization before seeing if the camp is successful this summer, LEAD Palestine has clear dreams of what they hope their organization will achieve. LEAD Palestine believes kids need to have a space and an opportunity to cultivate these skills.